Gerber Propel Tactical Auto » Protective Solutions, Inc. The Gerber Propel Tactical Auto is a sleeker, faster addition to Gerber’s line of automatic knives. The Propel Auto features a slender body and multi-position pocket clip, allowing the operator to carry the Propel Auto however they see fit. 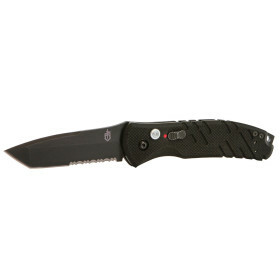 The tanto style 420HC steel blade is black oxide coated for corrosion resistance and minimizing reflective surfaces.